As the sender, you hand over your shipment to the carrier at the location of loading and have the transfer confirmed conveniently via the poolynk app. At the end of the transport, your customer also confirms receipt of the shipment to the carrier via the poolynk app with his digital signature. You will immediately receive a digital proof of delivery with all necessary information such as place and time of delivery, identity of the recipient as well as quantity and condition of the goods. You can view and manage this proof in the poolynk web portal, print it as a PDF or transfer it to your ERP system via an interface. You thus receive proof in real time and with minimum effort that your shipment has arrived at the recipient. Create liquidity faster through early invoicing, document damages for later clarification or settlement and meet the requirements for the documentation of intra-Community trade in goods for VAT purposes. If desired, you can also digitally document the exchange of your valuable pallets and containers at the lowest possible cost and thus considerably reduce the risk of shrinkage through transparency of the movement of the load carriers. Let the performance and the enormous savings potential of the poolynk platform convince you with a free test. 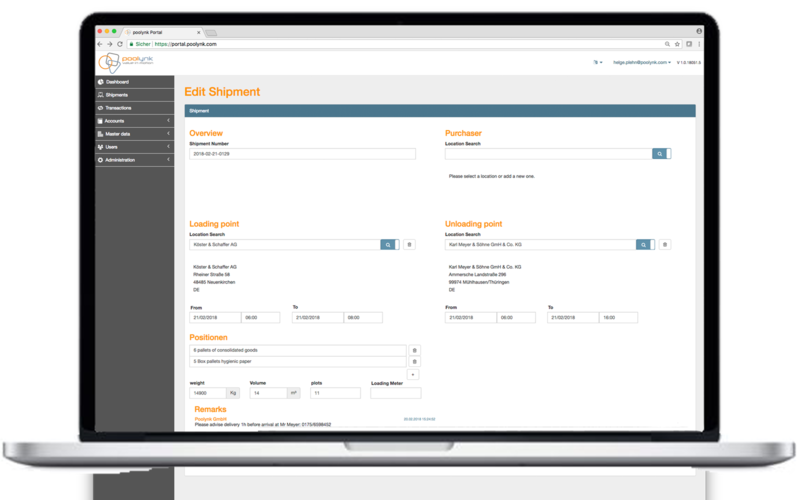 A shipment is created in the web portal or transferred directly from the TMS or ERP system via interface. The dispatcher assigns the shipment to a driver or an external carrier. This can also be done either in the web portal or via interface. Once assigned to a driver, the information is transferred to the driver’s smartphone app. The shipment is displayed to the driver in his app. This contains all the data required to carry out the transport. Loading can be recorded directly from the shipment. Only the type and quantities of load carriers have to be entered. Confirmation by signature is possible as an option. 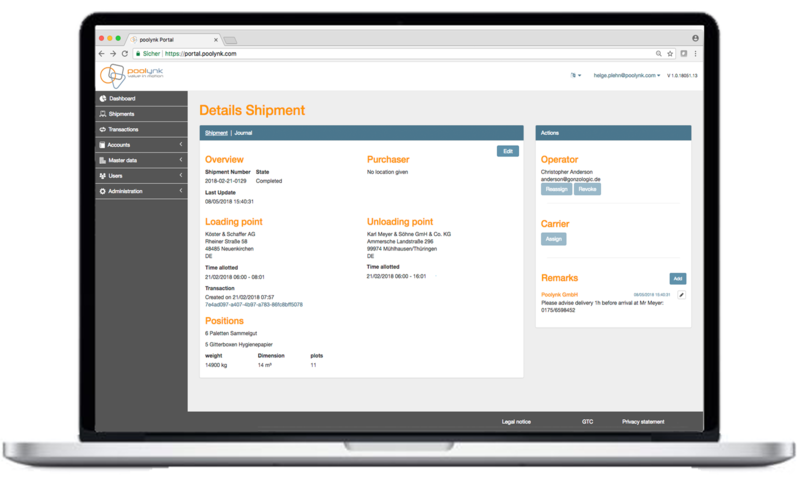 All information about the shipments and their status is available to all participants in real time. This means that the purchaser, sender, recipient and carrier are always on the same level. The data can be retrieved via the web portal or transferred to the systems of the participating companies via interfaces. The entire history of the shipment can be viewed via a journal. The linked photos of paper documents and load carriers can also be called up. The driver enters the unloading data at the unloading location. Here, too, most of the information is taken from the shipment. Optionally, photos can be taken of paper receipts and of the load carriers. In combination with the entry of a signature, all data for a proof of delivery is complete. 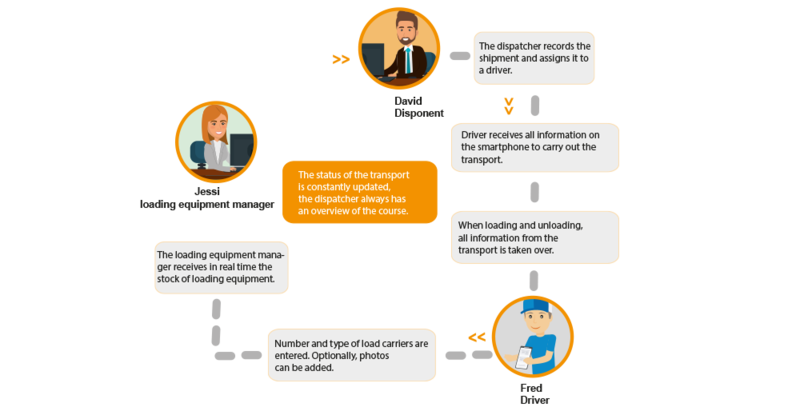 Tracking of the shipment status up to unloading and the transmission of photos of the accompanying documents enable proof of delivery in real time. In addition, the data for load carrier exchange is forwarded directly to load carrier booking (see Load Carrier Management). Convinced? Test the performance of the poolynk platform for free now!